A processor and distributor of aluminum needed to update its existing Matthews Marking Systems’ drop-on-demand printheads and controller to meet the changing requirements of a long-standing, cut-to-order customer. The previous system was unable to control the required number of printheads and offered limited messaging flexibility. Matthews Marking Systems installed its newest drop-ondemand printheads, backed by the MPERIA® marking and coding automation platform, to allow the company to expand its marking offerings to all its customers while reducing their ink usage. When a producer and distributor of cut-to-order aluminum sheets and rods was asked by a major, long-standing customer to expand their marking capabilities in the cut-to-length sheet department of their 100,000 square foot facility, the company returned to Matthews Marking Systems for an upgrade. As each sheet is cut, the company imprints lot and date codes for traceability (a requirement for military customers), as well as information about the material properties of a specific sheet, such as alloy type and thickness. More than 10 years before, the company installed two of Matthews’ 3000-series, 7-valve midi drop-on-demand printheads, paired with a Matthews’ controller, to mark the cut-to-length sheets from their position over the production line (top down marking). Although the system performed with perfect reliability—having never been returned or repaired—Matthews had since updated both technologies with improved and expanded functionalities. Further, the company’s outdated controller technology would not permit it to manage and operate more than four printheads. However, due to the customer’s new requirements, the company now needed the ability to run eight printheads simultaneously. The application required the aluminum sheet to be cut into different widths (either later in the process or by the customer), while each piece still retains markings for traceability. Having up to eight printheads would accommodate the customer’s request for more rows of marks on a single aluminum sheet. Matthews recommended replacing the outdated printheads with eight of its 8000+ 7-valve midi drop-on-demand printheads with two V-Links and a new, high-pressure ink pump—all controlled by MPERIA®, Matthews’ marking and coding automation platform. The 8000+ printheads utilize micro-valve technology and run for 6-billion cycles before tuning is required, making them even more reliable than the previous solution. They easily handle non-porous ink without clogging, and support marks made of inks with fast-dry solvent formulations. The printheads communicate with the MPERIA® platform via an Ethernet connection through the V-Link modules. 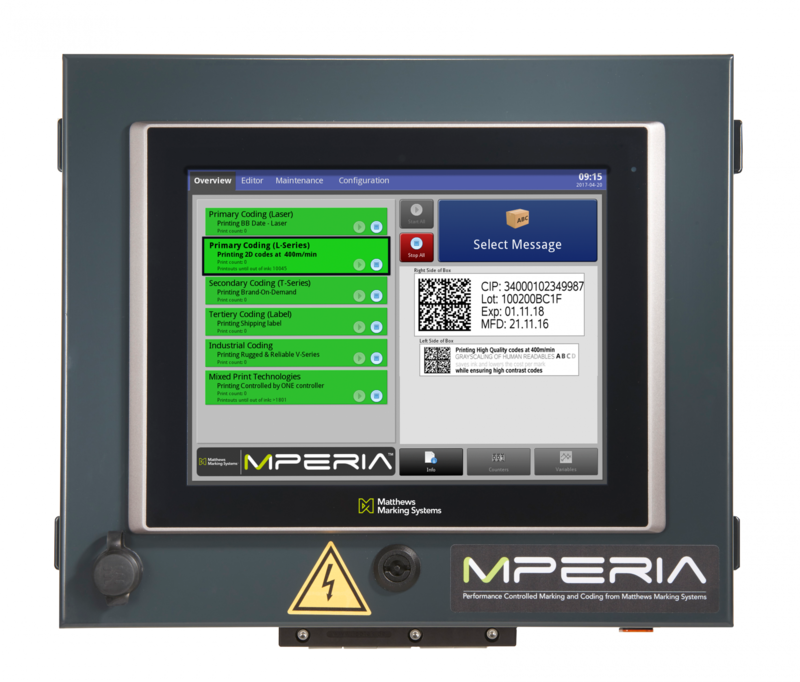 MPERIA® manages the operation of each printhead, as well as offers a built-in message editor that allows editing of marks, codes and other information via its touchscreen user interface. Since the installation of the updated Matthews’ solution—which took less than a day—the company has documented lower ink consumption per printhead over the previous system while maintaining the same level of mark quality. The marking system’s inherent flexibility allows each printhead to be easily turned on or off independently—depending upon the requirements of each unique job. Each can also be directed by MPERIA® to print a unique (or the same) message. Further, the printheads are adjustable across the width of the sheets, supporting different sheet sizes. These features not only accommodate the needs of the customer, but also allow the company to offer expanded marking capabilities to its other customers. System operators note that the MPERIA® user interface is much easier to navigate and use than the previous controller. The platform’s ability to store and support the modification of a much larger library of message options has also allowed the company to offer more options to customers and meet different marking requirements. 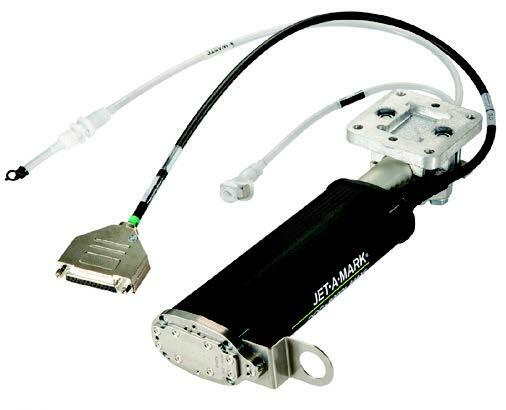 As an additional bonus, the Ethernet capability of the MPERIA® interface allows the print controller to be located next to the production line controller. In the previous system, the controller and printheads had to be directly connected. The new location makes it more convenient for operators to access.